With the growing market of smartphones worldwide, the price scenario of the world in case of smartphones has changed. Numerous companies have arrived in the competition of smartphones which has certainly benefited the customers. Apple and Samsung, which are considered as the leading smartphone brands worldwide, are slowly losing their market to other companies which provide cheaper and more reliable service. In Nepal, lots of new brands have arrived. So here, we have listed out the smartphones under Rs. 10000 in Nepal and some of their features as well. Huawei is a Chinese smartphone company that has been grabbing the major Nepali smartphone market recently. Out of total 24 handsets of Huawei in Nepal, the brand has three phones priced under Rs. 10 thousands in Nepal. Huawei Y3C phone is available for Rs. 6,999. It is a dual SIM phone. The phone has 512 MB RAM and runs on Android Kitkat OS. Similarly, Huawei Y541 is available for Rs. 8,499. The phone comes up with 1 GB RAM and runs on Kitkat OS. Besides, Huawei Y3II is also a good choice for a cheap smartphone choice. It is available for Rs. 9000 and comes with 8 MP rear and 2 MP front camera. The phone runs on 1 GB RAM and Android Lollipop. Samsung is the leading brand of smartphones in Nepal. Samsung has also two of its smartphones that have been priced under Rs. 10000. Samsung Galaxy J1, which runs on Android Kitkat, has 512 MB RAM and 4 GB internal storage. Samsung Galaxy Z2 runs on Tizen OS. It comes with 1 GB RAM and 8 GB internal storage. ZTE is a Chinese brand that has recently entered the Nepali market of smartphones. ZTE has two models which have been priced under Rs. 10000 in the Nepali market. ZTE Blade L5 Plus price in Nepal is Rs. 9990. The phone runs on Android Lolipop and has 1 GB RAM and 8 GB internal memory Its has 8 MP rear camera. ZTE Blade L5 is available for Rs. 8490. It has same specs as of ZTE Blade L5 plus but has camera of 5 MP. LG is also considered a reliable brand of smartphones. 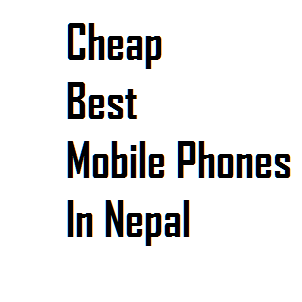 It has one phone under Rs 10000 in Nepal. LG L60 is available for Rs. 9,999. It runs on Android Kitkat and has 512 MB RAM with 4 GB Internal Memory. Intex is the brand with the most cheap phones. It has about 14 models under Rs. 10000.Intex Aqua Joyis available for Rs 5,099. Similarly, Intex Aqua Play is available for Rs 5,666, Intex Aqua 5.1 for Rs 6,590, Aqua 4.5 Pro for Rs 7,999. Aqua Bright can be purchased for Rs 8,199, Aqua Life 3 for Rs 9,199, Aqua Ring for Rs 9,299, and Aqua Twist for Rs. 9,399. Aqua Leon 3G is available in market for Rs 9,399, Aqua Craze Rs 9,899, Aqua Costa Rs 9,999, Aqua Star HD 9,200, Aqua Power Rs 9,400, and Aqua V4 for Rs 4,300.